4 x 10 minute videos of Ben Burtt giving a presentation at Pixar on how he made the sounds in Wall-E.
Wall E was clearly the most popular film for sound from the 134 nominated films, so I’d love to hear from the people who voted for it, what was it that motivated you to choose it? The 18 votes came from Michal Fojcik, Jeff Pitts, Tasos Karadedos, Paul Bell, Marin Vrbica, Buck Sanders, Sonal Dsilver, Rene, Sebastien Orban, Markus, JR Fountain, Enrique Deschutter, Carez, Matt Cavanaugh, Elliott Malone, Tom Ackroyd, Ian Palmer, Miguel…. When approaching sound design for a film that is clearly targeted at children, how do you decide on things like this? The parents taking their children are old enough for these sounds to register as being familar, so you get some comedic value from it. But for a kid who only knows about IPODs and soft touch keyboards, will those sounds have the same meaning or impact? Or will they just be meaningless sounds. Where do you draw the line between nostalgia and modern sound usage? Can you use nostalgic sfx aimed at kids and would it have the same meaning as a nostalgic sound aimed at adults? Can a sound effect be equally meaningful and nostalgic to all ages? I think one of the cool things about a good children film is their ability to appeal to the child and the adult bringing them there. Take the apple chime boot up sound. Everyone who works on or owns a mac can get a chuckle from that. On the flip side just as a sound it has this ‘air’ of royalty about it, something big and good 🙂 and put into the context of this little trash robot futzed makes it funny outside of the context of the mac. So it becomes funny on multiple levels and I think that makes it a success. In this case, with the use of such dated sounds, the nostalgia you will evoke will only occur in those people old enough and from a part of the world where they would have seen and used those machines(cassette recorder, PC keyboard,etc…). It is only in them that this sense of nostalgia will be brought out. To anyone too young to remember or to have lived it or to anyone from a much poorer country who might have not grown up with such gadgets, those sounds will not have the same interpretation. These sounds will be interpreted differently in people from different cultures and societies. So these small humoristic touches do have a specific public I would say. Using such sounds is great as it can add an extra layer of emotion for the viewer. It can evoke old memories of days gone by. And it ties the film into reality via historical references. But when does the usage of a sound that only a certain percentage of the audience will get extra meaning from take precendence over a sound that all everyone can take meaning from? I am sure a lot of it comes down to the sound designer / director’s personal history and choice. Does anyone ever stop and consider what “a sound” will mean to the different demographics and what sound will get the best reaction across all demographics to achieve a soundtrack with the great appeal? The echo’ing music really helps to create the feeling of an empty world. I think it works much better then just using the desolate / empty wind ambience. The ambience by itself would have worked, but the music echoing in an empty city adds a layer of extra interest because that is a sound we as human’s would never hear in our lives. We all could have the chance / or have expereinced hearing a lone wind sound. But hearing a music track echo around in a city is something entirely new for our brains to process. I think this helps create immediate interest in the film as our brains want to know why this is happening. Using music here certainly makes you perk up and realize how alone he is in this space. I think of Saving Private Ryan’s use of Edith Piaf’s music playing through the streets of that french town and how empty the place was. I think the effect is similar. Also, how cool of a reverb this is! I love hearing the slap of the sound coming back from the buildings. I would be interested to know if this was achieved through convolution or actual worldizing (sp?) of the music. Or possibly a delay mixed with a verb with a long pre-delay time. It has music which echos in an empty city. I know this was done by loading up a truck’s cargo bed with massive speakers, then driving through downtown Toronto in the early morning hours, blasting music around the sleeping city. A following vehicle recorded the resulting sound. Indeed this is a powerful use of simple sonic elements used in the storytelling and developing/establishing of the location. I agree with you Timothy regarding the value of that added element of the music and the way it is used to support the images. I think a very important aspect of designing sound for a film comes from the need to entertain the brain and tease our mind. We have to support the story and the character and plot deveopment while capturing the viewer´s attention and entertaining their minds to keep them actively interested and drawn into the film. As always, it is not about putting sound to what you see on screen, but sond is telling the story or revealing a new aspect of it on its own! I also thought of Saving Private Ryan and their use of Piaf´s music beng played in the war torn streets. Another film that used this was The Pianist which was used in a similar fashion as we can hear the piano ringing throught the empty and war torn streets. It seems to be a technique used quite a lot in the world of sound for film, seeing how many films have used this creative use of music! Did anyone notice if there were any audio difference used to distingush normal Wall-E from “memory wiped” Wall-E? -His tape playback played static. He got an almost full overhaul by EVE during the repairs, but I don’t remember any other audio differences. Perhaps this was done this way to let us know he was still Wall-E inside? One more use of audio in that ending scene is when Eve has just finshed repairing Walle-E and blasts a hole in his home´s roof. We then enter an almost complete silence as everyone awaits a reaction from Wall-E. This silence supports the idea of his memory being lost. He no longer has a sense of life and emotions within him. 00:08:00 – Hal walking on garbage. The sfx for steps are always played at same speed no matter how fast he moves. Even though the sound is not in sync, it works as there is just to many clicks and too many feet for our brains to register and seperate out. to him. The fact that the levels of his movement sounds (the handcuffs) were always loud enough to be clearly up front in the mix was again Ben Burtt´s method of keeping the mix of elements simple, choosing only what is needed in each shot and therefore allowing each of the chosen elements to shine and be heard without any masking. @21.39 blasts her way out of trouble = shes got a temper! Yeah! Eve sonically changes a lot as she goes from one temper to the next! The way the sound support her smooth moments in comparison to her hostile ones is very effective. @36.40 = love the head shaver bot sounds! Is there a specific sound used for MO moving / rolling around? I could not hear one. Apparently there is a sound of MO moving around. But I still have trouble hearing it in the mix. I guess the cleaner tool is always buzzing and when he is not cleaning other robot sounds cover it up. Yea, you can hear him move at 00.35.55 and again at 00.36.56. A very nice and subtle rolling. 00:43:55 Autopilot’s mechanical movements are all very sharp and knife like sounding. Perhaps sublimally telling us he is not nice and will stab the captain in the back? 00:43:56 Auto’s voice – very deep and sinister. Matches his evil nature. I like the way you have associated hiw sharp and knife like sounds to him being a back stabber. His vocalizations and movement do give the viewer a different feel compared to say Wall-E. We are subliminally on guard and not empathetic to his character. My take on this was not an “insert ship name here” gag. My first and still my impression was, “Wow, bad ADR editing.” Perhaps is the inserted ship name “AXIOM” was a different voice then it would help sell the gag better, as we would clearly know someone else spliced it in? 01:23:15 Near silence. Only ship’s voice counting down is heard. And at ZERO there is near silence. Helps to make the incoming hyperspace SFX seem even more loud! The silence also makes the pain of Wall-E and EVE even more exterme. I’ve noticed how many times silence is used in the film in different ways and to convey different meaning. At the start of the film, silence or near silence is used to support the images of the abandoned and empty city void of life. 0.23.32A funny touch of humour with the singing fish. Love his accent! 0.39.37We can hear all the baby humans with their pacifiers! Quite funny! I really like the sound of the sizzling heat as well as Wall-E trembling! The ground really feel like its alight! 00.26.47 As Wall-E tries to grab EVE’s hand, there is extreme detail in the sound of his movement as he strains nervously to take hold of her hand but is then refused permission, so he then pretends he was not trying to take her hand. Nice romantic moment with a touch of comedy. 00.20.37 Great sounds of EVE being trapped by the giant magnet and the creaking sounds as she tries to detach. I think most filsm would just give the robots voices. But giving them more expressive human traits is a great way to give them true life like qualities which we can immediately relate to. The following suggests robots breathe..
great detail and work has been put into giving these robots a human lifelike characteristic. Considering there is no real dialogue, all character description and development must occur with sounds, in this case mechanical or other robotic sounds. Each squeek, movement, and part is designed to support the emotions of the character at that given moment. They truly do come to life. I like the sounds of Wall-E’s “eyes” or goggles as he focuses and defocuses when trying to analyze a moment or object. 01:15:51 A great use of doppler even though nothing goes by us. The police siren has a doppler on it even though the police bot never changes distance from us. Used to show us the bot is slowing down, even though distance does not change. I know Ben Burtt has used the Kyma X software a lot and that is really good for creating Doppler effects… I have never used Kyma but on the film i am supervising sound for at the moment, our sound designer who is creating the creature vocalizations is working within Kyma. Its a great tool…however it is hard to get organic sounds…much of it sounds synthesized and digital. Perfect for robots or a film like Wall-E but not as convenient for more organic sounds. But I’m trying to get my school to get a Kyma X system with the Pacarana or Capybara hardware and learn it in depth! The manual seems to be this massive textbook or “Bible”. But it looks really cool and fun and full of creative resources! 00:38:03 Gas station bell ding is used to call out the service bots. 00:44:29 Jelly SFX used for massaging the captains’s feet. 01:11:54 PC mouse clicks used as mice feet sfx. HA! 00:25:18 Wall-E raises eyebrows to the completed Rubic’s cube. A cartoon boing SFX is used. Cute. I particularly loved seeing how old and modern sounds have been blended in the film! There is a lot of modern sounding effects and high tech sound but then we also have many small boings and twangs reminiscent of the more classic cartoon sounds! Burtt had access to Disney’s arsenal of props and toys so he probably used a few of their original classic sounds! I really loved the fusion of the old with the new in this film. I am really interested in adding the kyma to my own sound arsenal and I am always interested in hearing it in use. I use a joystick with my modular synth to control x-y axis of whatever control sources I deem fit and I got a chuckle watching benn use a wacom tablet to do the same thing within his kyma rig. I think there is a lot of power in real time control to add nuance and human emotion to the sounds. I feel I learned a lot watching this film. I don’t get to work on such projects very often but I always welcome the challenge of them. Here is a small robot project I did. As there is no dialog I also tried to create a sense of communication via sound effects and noises. As I mentioned in another post earlier, the Kyma X software was used a lot in this film and is clearly heard in many other films as it has a characteristic sound to it, or at least some parts of it. I am trying to get my school to get a Kyma system as it would be grwaet to get to know how to use it, though people say it is not too user friendly and takes time and dedication to learn it more in depth! I’d love to be able to though! The music – music pieces appear to be contrasting throughout the film. – The the same music turns dark. – Then we have happy / comedic music as Wall-E starts a new day. – Then we have dark music as the ship lands and deloys EVE. – Then we have happy music as EVE does her freedom flight. Wall-E and EVE – constrasts their difference. Are they to unlike to be together? – Wall-E sounds are motors, servo’s and rattling. – 00:30:08 Wall-E hooks cables to his power and creates 2 sparks. Very subtle electical sparking is heard. – 00:30:11 Very loud and sharp sparking is heard from EVE. – 00:20:54 EVE wakes up. The reboot sound is very similar to the MAC startup chime used for Wall-E, but more processed and techy. Gives us the feeling that Eve and Wall-E might be similar enough to be together. 00:46:45 Button pressing on EVE to wake her. Very old school type of mechancial sounds contrast with the high technology of the society. 00:17:23 EVE has a lot of tonal elements to her actions / motions. (hovering, flying, arms appearing, waking, sleeping) This shows her soft high-tech-ness. But her arm folding into a gun is very hard and mechanical. This is a good contrast with her soft high tech side. EVE at the start seems cold. Her scanning SFX is loud and sharp. But later this changes. 01:14:08 EVE’s scans for a replacement board for Wall-E Now her scanner is more soft and warm. It shows she cares. Nice little details you’ve picked out there! I’m enjoying reading and listening to all this stuff you guys are pointing out! Diegetic / non-diegetic music used to bookend the movie. 00:01:56 Music changes to be diegetic. The music is now ‘dark’ even though it is the aame music. 00:03:01 Wind + chime sfx used to accent the shot of the sun. 00:19:15 A wind SFX is used to accent the lifting smoke reveal EVE to Wall-E. EVE is backlight with lots of sun. The smoke is disapating, not being blown away so the wind SFX does not make sense technically but the effect works! – The reverberant playback of music from Wall-E as he moves between the towers of garbage. Excellent use to show how empty and alone the world now is. 00:03:24 Harp music – lonely and desolate. Gives us the emotion of being alone. Very alone. HAL music is very upbeat and happy. Comic relief music? Music is not used to tell us how to feel, but used to tell us how the main characters are feeling. 00:09:17 A massive sandstorm is going on outside of Wall-E’s home, but all we hear is Wall-E’s playback of the love song + a few metal tings. We do not hear howling wind or debris hitting Wall-E’s home. This emptiness addes to the loneliness. Also tells us this shelter is safe. It is home. Yes, I saw this detail as a nice description showing his home as a warm and safe place to be in, without any of the sounds that make the outsides so empty and solitary. Instead he is surrounded by his toys who all make small subtle sounds that can be heard perfectly adding a sense of life to the interior. 00:18:33 Wall-E shakes his head (negative servo sound) VERY R2D2 ! 00:54:15 Explosion SFX – has metal shearing quality, very similar to the carbon freezing sound in Empire Strikes Back. 01:12:08 Airlock opens and garbage blocks blow into space. The intial sucking air hiss reminds me of the air lock scene in Moonraker. Sometimes Wall-E makes no sound. 00:13:25 Wall-E reaches for the red dot on the ground. We hear no normal servo / motor sound. There is just music. ..Wall-E running around is heard. 00:26:50 Wall-E presses button to cycle through shelves. Very little shelf motor, debris, clatter SFX is heard. 00:53:57 Wall-E runs through the wall of glass. .. very little debris of tinkling glass is heard. 00:54:36 Robots all run through the glass door and break it apart. VERY little glass impact or breaking is heard.. Mostly just robot voices, and nioses. 01:25:37 EVE’s sonic boom is not very present. Mostly low end. But when she first does this at the start of the movie the boom is massive. Like Walter Murch once said, ” three trees make a forest” meaning that more than two elements of sound at one time will start sounding crowded. Throughout the film, Ben Burtt uses a very minimalistic approach to sound design putting in only what supports the story at each moment. Sometimes I was surprised by the lack of sound but then I’d realize it had a reason. Sometimes large explosions weren’t heard as loud or large as expected but there still was a sense of the right dynamic range! 00:16:16 Rocket ship takes off and flys by the camera. … sound of engines stays the same, no massive build up as it approaches camera. … music does the buildup of engery instead of SFX. 00:33:18 Rocket launches and flys by camera. – This time, rocket engine and Wall-E screem build up as they approch the camera. – Music buildup is secondary this time. Makes the 2nd launch more impactful and meaningful? 00:13:58 Sizzling rocks only sizzle for about 5 seconds before suddenly stopping on the wide shot of Wall-E hitting his head. 00:21:24 The magnetic humming sound is very present at the start, but then goes away to almost nothing. I guess once it is established it is not really needed anymore. Would it constantly humming just become whitenoise anyway? Walls of sound just confuse the audience and create listening fatigue. When editing sfx or doing sound design for an intense scene as a battle or something similar, rather than putting sounds to everything you’d expect to hear, I like to think of it as focusing constantly from one element to the other. Kind of like pointing a flashlight and seeing what it reveals. So instead of hearing everything, we are in a constant swinging from one center of attention to the next thus not being saturated by the sound but still getting all the narrative content! Totally agree we need to keep things interesting. With the magnetic being a key object in that scene, I just a little surprised how quickly it was removed a key focal point. 00:17:34 Eve shoots the rock. 00:17:37 We change back to closeup of explosion. But the sound does not change perspective this time. The sound stays as the far perspective. 00:21:53 No perspective change on the ship explosion SFX (should be hearing stuff in the rear channels) Why keep it all kept in the front channels? How do you make a robot sneak around queitly? 00:18:19 Wall-E secretly follows EVE. – Wall-E is bouncing and moving fast, but we hear very little from him. SFX are played down. But you don’t really miss anything. It works. 00:47:43 Wall-E is quiet but fast. Shopping Carts – too little? 00:19:59 Shopping carts chase Wall-E and pin him to the door. – Very thin on the shopping cart SFX. – Does not give the feel of heavy metal bearing down on him. – And no big metal pileup at the end either. – Was this done to keep the mood light and happy with the music? 00:21:14 Plastic door is slammed shut. – Then a small metal door is slammed shut. – Then a large metal door is slammed shut. The SFX for each gets bigger and louder. The growing size shows EVE’s growing fustration. 00:21:46 Tree creaking sfx as the ship starts to fall over. Or is it metal creaking. Whenever I hear that type of sound, I immediately think tree. 00:23:03 There is a high pitch tone as EVE raises her shoulders and laughs. This made me think that EVE’s voice sounds like it is being played through a metal tube/pipe. Probably not how the voice as made, but possible a quick and easy way to achieve a similar effect. 00:23:37 Storm front hits – There is a big metal bang used to hieghten the impact instead of the usually loud wind type of sounds. 00:29:12 Wall-E screams “EV-VA” and it reverbs out into the transition to the next day. The reverb has a time dimensional quality which helps bridge the passage of time. Eve’s glowing green display light also echo’s out. 00:29:47 Lightening crack SFX is used for the transition even though there is no VFX for it. Foreshadowing Wall-E is about to be struck by lightening? 00:51:53 The ship’s voice carries the tranistion to outside the ship. 00:33:38 Space. Not everything makes a sound in space. The ship makes no sound here. (but it does later…) The satellites make no sound was Wall-E shakes them off. We only hear Wall-E’s motors and voice. 00:34:17 Video screen on the moon makes sound. Funny as people on the moon would be in suits and not hear it. 00:34:20 Sun flare makes a great sound. Good burning and movement to it. 00:34:35 Planet’s ring particles make no noise until Wall-E touches them. 00:35:18 Ship now makes noise as it flies by the camera. 00:51:57 Low hum as we fly by part of the ship. No visible reason for it. But it gives a great sense of movement. 01:00:19 AXIOM engines are very subtle for their size and the amount of energy they are putting out. Kept low as to not interfere with the music? 00:39:07 A car horn beep sfx is used to show the flow of robots is literally like traffic. 01:15:54 Police bot stops. A tire screech SFX is used. Comical but it works as it informs us of a sudden stop and helps to remind us of the traffic in the hallways. 00:57:40 There is a negative tone element to the escape pod being launched. Foreshadowing of something bad is about to happen? Explosions are all rather muted except when caused by EVE. When EVE blasts things they explode BIG. But other explosoins are all that muted. 00:58:39 Escape Pod explodes. Very low end. No sharp high end elements. Bblends in as a musical hit / crescendo. Very different in contrast to the sharp attack explosions from EVE’s gun. 01:18:57 GO-4 falls to death and explodes. Explosion is very subtle. 00:54:10 The low growl of the slow motion laser blast really addes a life like quality to it. 01:10:19 GO-4 hisses at captain. Organic life quality given to a machine to make it seem more alive. 01:12:11 Big garbage machines have heavy and deep growls. 00:54:24 Blue energy screens holding robots in pens start to fail. They turn off in order from left to right. As they turn off one by one, the sound is pitched down each time giving the added sense of power going off. Wall-E’s solar charger is his heartbeat. 00:59:46 EVE kisses (sparks) Wall-E. Wall-E’s solar charger starts to beep, faster and faster until it is a steady tone. Does this mean, that Wall-E’s heart has started to beat fast and then flat lined…? Wall-E has died and gone to heaven. 01:17:11 Captain bangs his fist against the elevator door. The door is thick metal, but the SFX sounds like thin TIN being hit. Was this a stylized choice, or meant to show the weakness of the humans. Sound used to represent memory. 01:27:40 EVE presses Wall-E’s play button. Static hiss is heard. Has Wall-E’s memory been wiped? Great symbolism. the abandoned city but contrasting with the cheerful music. Then there are a few extreme cuts were we almost go to silence eg; @ 00.02.02 and @00.02.25 as Wall-E disappears off screen. Like Tim mentioned, the location is quickly being established and portrayed as an empty and abandoned world. This “technique” and creative use of music is used in many other films to portray the same sense of emptiness (Saving Private Ryan playing Edith Piaf´s music through the empty streets or The Pianist where we can hear the piano playing as it rings through the abandoned streets of yet another war torn city). The music that started off as non diegetic soon takes a change of perspective and is heard as being played by Wall-E´s tape player which is then turned off at 00.03.04. Regarding the mixing, it caught my attention how the level of the music stays the same or even drops when we get the first close up of Wall-E compared to when we were hearing it from way above. If you were to try and recreate the correct sense of distance and perspective, the music would go up once we got down to ground level with Wall-E. However, that is not the case and the sound effects are given plenty of space to breath. Even HAL´s subtle movement is crisp and clear and as loud if not louder than the music and even the sounds of Wall-E´s movement. Few elements, but they each have enough space to breath and “speak” with their full frequency range. and atmosphere are pretty much the only sounds of the city! Compare this to the end of the film where the Axiom is landing and a huge trash skyscraper crumbles to the ground, you can hardly hear it crumble as so many other sounds are being heard at the same time such as the landing of the spaceship or the displacement of dirt and debris as the ship lands. to him. In addition to his sounds not really following sync but focusing more on mood, the fact that the levels of his movement sounds (the handcuffs) were always loud enough to be clearly up front in the mix was again Ben Burtt´s method of keeping the mix of elements simple, choosing only what is needed in each shot and therefore allowing each of the chosen elements to shine and be heard without any masking. gadgets. This is a big contrast with the exterior impression were all we hear is the winds and Wall-E´s movement. Supported by the music, his home opens up as a warm and lively environment where even his lifeless little toys seem to have more life than anything else in the city. 00.07.04 Wall-E is further described as curious but still in the process of learning as he now encounters a plastic fork with a different shape to the rest of his forks which has more of a spoonlike shape and he is confused as to wether it should go into the forks recipient or the spoons´one! elements and reactions and describing his sleepiness with the use of sound effects in his movement. Wall-E is awake and ready for a new day. Now his movement sounds are smooth and energetic. 00.11.18 Wall-E has just discovered the plant which represents life. Contrasting with the earlier use of silence, atmos and music to support emptiness, we now have a similar silence but this time with no wasteland atmos and the music is non diegetic, mysterious yet warm and sweet. A real live plant is now on screen and therefore the emptiness and dead wasteland sounds are taken out. 00.13.40 As the ship has landed and the confusion has settled down, everything goes very silent as we wait to see what happens net. This is used all the time, using silence or partial silence with scarce sonic elements to create a sense of uncertainty, expectation and suspense. @8.20 there is a silence before a storm. After silence, loud is louder. Yea, I´ve written that moment out on my notes too. Creating a moment of silence to add tension before an action or happening is very powerful. It aso allows any following action to have a greater impact and perceived loudness without having to actually make it physically louder. 00.14.21 There is a weird vocal sound as EVE comes down the tube and is placed on the earth. It’s a cool sound but wonder what it is? Maybe just a processed vocal sound? I was thinking about it too, cause it saunds like a growling (it can be good to emphasize the unknown/threatening character of the rocket). But it can be object falling down a vacuum’s tube (and the tube’s resonance). So then, both (dangerous mood & falling through a tube) work good in this context. This sound really stands out. I think even non-sound people probably took notice of that one. It could be one of those natural sounds that sound processed. You know what I mean? Some sounds have a naturally high resonance that makes them sound synthesized. I didn’t have a strong emotional reaction to it as much as I just found it interesting. Maybe that’s just me. Now that I think of it though it makes sense to have such a memorable sound introducing a main character. 00.16.09 Nice and smooth fan like sounds as EVE takes off. Like an ultra smooth helicopter! I like the deceleration that occurs in that fan like sound as she has gained altitude and then takes off. 00.16.25 EVE seems to have broken the speed barrier as we hear the crack of the explosion indicating the speed and acceleration she has! and size that really works. 00.22.51 When Eve is caught in the sandstorm, I like how her voice comes and goes as the wind violently moves the sound in different directions! This places the audience in the location and makes you feel the strong power of the wind! 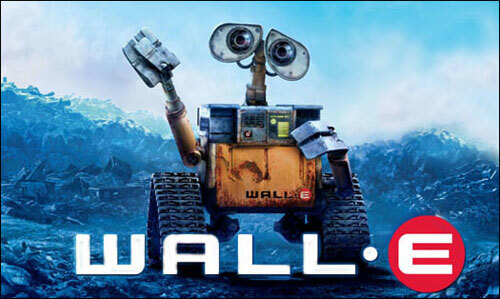 00.23.06 The music changes again as EVE enters Wall-E’s home for the first time. It is a beautiful and melodic theme with very dreamy and intriguing characteristics which reenforces EVE’s experience of seeing so many things new to her. 00.25.10 In her ignorance regarding dance, EVE starts stomping about shaking up the whole “house”. There is comedy in Wall-E, a robot, trying to explain or teach EVE how to dance. Compared to Burtt’s usual style of being discreet and subtle, here the sound goes full out emphasizing her ignorance of things human and how she overuses her power to try and do something simple as a dance. 00.27.30 As EVE finally find the plant she was looking for, she is taken back to her original self, focusing on her mission. She absorbs the plant and falls “asleep”. She has taken that plant which was a symbol of life! So the sound takes a dramatic change again. As soon as she falls asleep, we return to a very silent state with the only real element being the sounds of EVE’s beeping status which is a cold and lifeless computer tone, again supporting the fact that life has been taken away. Right then Wall-E’s voice @ 00.28.09 dissapears into reverb, exactly as used in the start of the film, returning to a state of emptiness, solitude and a lack of life. 00.29.14 The texture of the water is very special. It sounds very thick, almost like wading through oil or petroleum which could be symbolic for the polluted state of the environment. 00.32.24 I like the contrast of sound as Wall-E , with the spaceship, leave the earth’s atmosphere and enter space. After a moment of hectic confusion and loud sounds, we enter a state of silence hearing each detail of the detaching satelites! 00.33.09 Wall-E recognizes the location as being the sun and quickly uses the moment to recharge his internal battery with the solar panel. Again we heard the Apple startup tone which is used throughout the film, a nice like touch of humour. Apple should use Wall-E to advertise and add him to the “Hi, I’m a Mac!” range of adverts! 00.34.46 The music changes drastically and becomes this 4/4 rhythm that emphasizes the order and organization that takes places as each robot and machine performs his assigned task. They move in a line, wait for permission to move all working as a well oiled machine. 00.36.17 As security arrives, they make a sound resembling that of a police siren, a sonic indicative of them being the patrolling authority on the ship. 00.36.58 As the robots are passing by and returning to their positions, we can hardly hear them. In contrast, as soon as MO comes into view we hear the intricate detail of his movement which has several layers. We are focusing on the main character for this moment. 00.37.09 Nice use of a negative tone to indicate the wrong action of leaving his marked line of motion. This happens again @ 00.39.04 when Wall-E causes a small accident in traffic. 00.39.37 We can hear all the baby humans with their pacifiers! Quite funny! I like the general idea that all policeman-robots are talking the same voice (and in sync/simultaneously when there is a group of them on screen). Like in THX 1138. They are all one kind/clones. I meant not only the same voice but also with one voice only (if there is a group of police robots on screen). Without any latency. So they are part of the same organism. The more I am reading our comments and thinking about the movie, I am realizing how light it is. The sounds, the mix, the music. I don’t mean it’s only about light entertain, because it’s very smart story, especially for young ones – very educative. And sometimes its soundtrack is very complex. It’s a mastership, to create so kind world of sounds electric/sci-fi origin. With so many emotions in sound design. And sounds which will be remembered by non-sound people. And there never is too much. Sometimes it even amazed us how much is not in it. But I think (IMHO WallE is and will be the classic in the history of the cinema) many people will learn from it making the choices of what is and what isn’t necessary. I think the soundtrack will stand the test of time because it is based in reality. Burtt’s use of recorded sounds as much as possible helps to make the sonic landscape familar and recognizable to our brains. We hear something and we know it has a real life quality to it, so we can relate. Plus it accents such a great story and amazing visuals. Everything works together as a whole. Film making done right.